Ramp Up is a supplement intended for people who want to stop dragging their feet and give it their all in the gym. It’s also designed to be a fat burner, so, if it works in the way it’s supposed to, it could be a good option during cutting cycles. Ramp Up is produced by Force Factor. The company is based in Boston (USA) and produce a number of other supplements, including Nitric Oxide boosters, pre-workout powders, and testosterone boosting supplements. 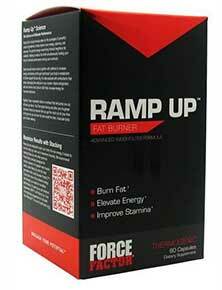 Force Factor claim Ramp-Up burns fat, boosts energy, improves stamina, and resists muscle fatigue and soreness. The combination of ingredients used in the formulation should be able to achieve these things. Green tea is a proven fat burner. Caffeine has been shown to have fat burning potential as well and it’s also a good energy provider. Like green tea and caffeine, cayenne is good for fat burning, but Force Factor have included it as part of their proprietary blend, so there is no way to know if enough has been included. Alpha-Ketoglutaric Acid is a substance the body needs to produce energy. It’s often added to supplements designed to boost stamina, but it’s known to be capable of irritating the stomach and further study is needed. Several of the ingredients may have the potential to reduce muscle soreness. White willow, meadowsweet, and wintergreen are all botanical extracts that provide a compound that is very similar to Aspirin. However, the salicylates they provide can be very hard on the stomach. It may be unwise to consume them over long periods of time, and Aspirin is not a particularly powerful painkiller anyway. Maté is a caffeine provider and bladderwrack can help provide the thyroid with the iodine it needs when manufacturing the hormones that are responsible for governing the metabolism. Believe it or not, Mustard can be good for relieving pain, but no inclusion rates are provided for these ingredients and it is possible they may be included in insufficient amounts. Marine coral provides calcium, which is known to assist energy production, but sea coral is often contaminated with pollutants, so it’s not one of the safest options for anyone looking for a good calcium provider. Force Factor don’t mention if side effects are likely to be a possibility, but side effects have been reported and the most common problems appear to be stomach-related. The formulation will not be suitable for women who are pregnant or nursing a child. People who have existing health problems should always check with a doctor before using any brand of dietary supplement. Anyone who is taking medication will need to be equally cautious. How To Use Ramp-Up – The dose is one capsules or two, depending on personal preference and/or training needs. The first dose of the day is taken in the morning, the second during the afternoon. Ramp Up is available via some popular online stores, from Amazon, and via the manufacturer’s website. Each bottle contains 60 capsules and the price can vary quite a lot. Amazon appears to be the cheapest option because the price is only $18.95 per bottle. Buying directly from Force Factor seems to be the most expensive way to go because they are asking $49.95 per bottle. Force Factor fails to offer customers a money back guarantee. Although the ingredients used in the formulation should be capable of furnishing the product with the kind of abilities Force Factor claim, Ramp Up appears to be harsh on the stomach. The formulation contains several ingredients that have the potential to upset/irritate the stomach, though, so it’s not surprising that so many customers report having such issues. Customers feedback suggests not every user is likely to have problems, but it’s the luck of the draw. The only way to ascertain if you can stomach Ramp-Up is to buy it and see. However, there is no money back guarantee. So, if it turns out the product is not for you, a refund will be out of the question.